A large majority of newer model Chromebooks are able to run apps found in the Google Play Store, opening up a wide array of functionality not previously available on Chrome OS. One of the more popular apps is Skype, which lets you communicate online through voice, video and text-based chat. Unfortunately, this is not the case for many older Chromebooks, where Google Play app support isn't always available. If your particular model falls into this category, there is a workaround that will allow you to place audio and video calls using your webcam and a microphone via Skype’s browser-based interface. While it doesn’t feature all of the bells and whistles found within the Skype app, this web-only alternative still gets the job done by coming very close to mimicking the desktop experience. To find out whether or not your particular Chromebook model supports Google Play apps, take the following steps. Click on your user photo, usually located in the bottom right-hand corner of the screen. When the pop-out window appears, click on the Settings icon – represented by a gear. Chrome OS's Settings interface should now be displayed. Scroll down and search for a section labeled Google Play Store. If you cannot find this section, it likely means that your Chromebook model does not support Google Play Store apps and you'll need to try the alternative method found later in this article. If you do locate this section and it is not already enabled, activate it by selecting the TURN ON button and clicking Agree to the Google Play Terms of Service when prompted. If your Chromebook supports Google Play Store apps, then installing Skype is the way to go. The full-featured app includes everything that Skype has to offer, all in a user-friendly interface. Open your Chrome browser and navigate to the Skype page in the Google Play Store. A progress bar will now be displayed, detailing the status of the file download process. Once complete, Skype will automatically be installed. After installation is completed, select the OPEN button. Skype will now launch and prompt you to either login or register for an account. 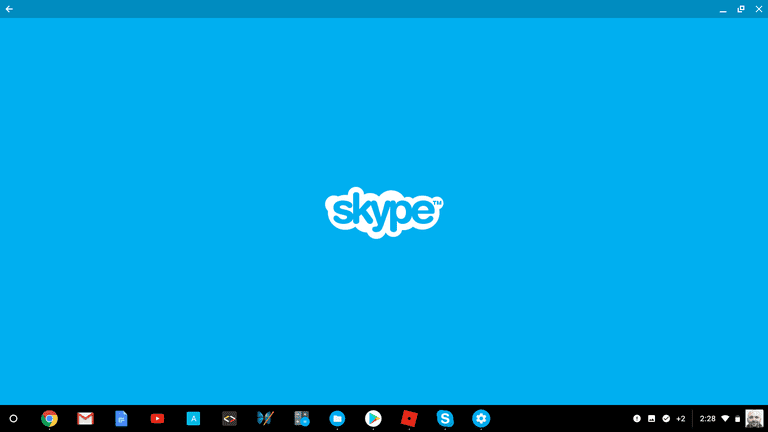 To use Skype at any time going forward, click on the Launcher button in the bottom left-hand corner of your screen and choose the app's icon. The first time you log in to Skype you'll be asked whether or not you wish to let the app access your contacts. This is optional, and you can continue on by clicking either the DENY or ALLOW button. You'll also be asked several other permission-related questions, including the following – each accompanied by a DENY and ALLOW button. Allow Skype to manage and make phone calls? Allow Skype to access photos, media, and files on your device? Allow Skype to record audio? Allow Skype to take pictures and record video? Your answers to these questions will determine what capabilities the app will have, such as making video calls via your Chromebook's webcam. If you've chosen to deny certain access and try to utilize functionality that requires it, you'll be asked once again for your explicit permission when making an attempt. If your Chromebook model can't take advantage of Google Play apps, Skype's web-based version is certainly a respectable alternative. From here you can still access all communication methods that the app offers. Open your Chrome browser and navigate to web.skype.com. You'll now be asked to log in to Skype or to register for a free account. Once you've successfully signed in, you'll be presented with a Skype interface, not unlike the one found in its apps. From here you can initiate phone calls, video and/or text chats as well as access stored contacts. You can also send and receive contact requests to and from family members, friends or colleagues. As is the case with the Skype app, certain permissions are required to utilize the webcam, microphone, file system and more. The key difference is that in this case it will be the Chrome browser asking for said permission, as opposed to an application itself. For example, if you try placing a video call the browser will request permission to use both your Chromebook's camera and built-in microphone – which you'll need to allow if you wish to complete the desired connection.